The Dynamics Configuration Generator is a tool used to generate all the necessary configuration files for a specific Microsoft Dynamics CRM Organization, in order to index it properly. Log into Microsoft Dynamics CRM Organization with an administrator account. Click the Microsoft Dynamics CRM drop-down menu in the top-left of the screen, and then select Settings. Click the Settings drop-down menu, and then select Customizations. In the Customization page, click Developers Resources. In the Developers Resources page, take note of your Organization Unique Name and Discovery Service URL. 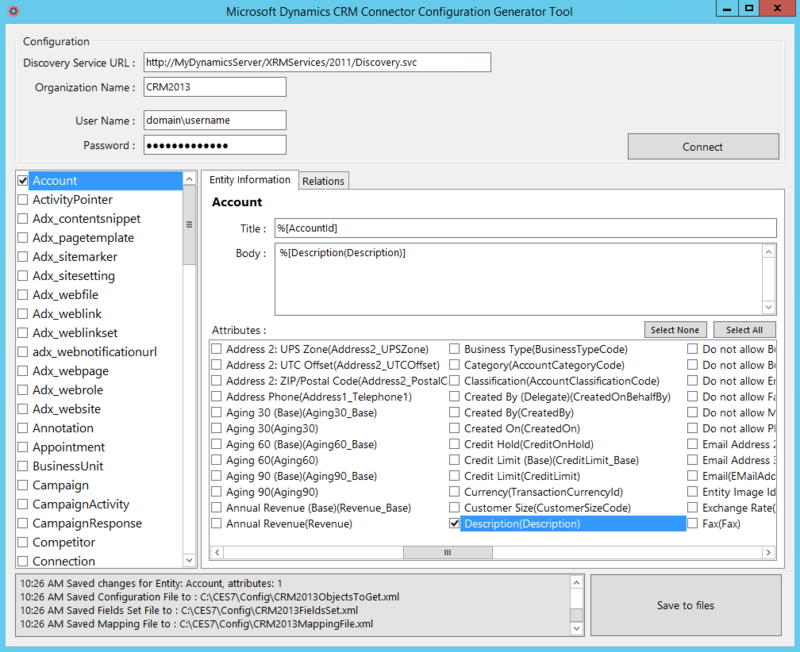 Open the Microsoft Dynamics CRM Connector Configuration Generator Tool located in the CES 7 Bin folder. 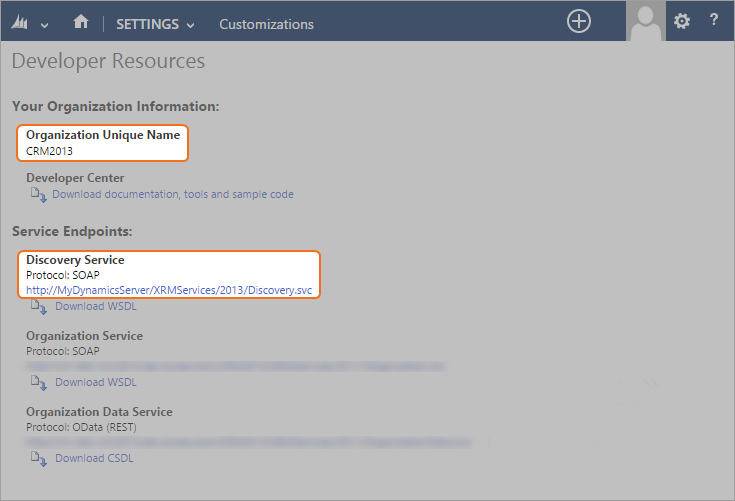 In the Discovery Service URL box, enter the full discovery service endpoint URL. In the Organization Name box, enter the organization unique name. In the User Name and Passwords boxes, enter the credentials of the administrator account you previously used to create a user identity (see Microsoft Dynamics CRM Connector Deployment Overview). The connection to the Organization is initialized, displaying any errors and retrieving the complete entities schema. Retrieving the schema can take some time to complete. After receiving the schema, a list of entities will be displayed in the left panel. For a better experience, the tool does not show entities that are not customizable. These entities are normally system entities with no relevant data. CES 7.0.7599+ (April 2015) Meaningful entities and their attributes are selected by default. In the left panel, select the check box next to the entities you want to index. Note: Your selection defines the content of the ObjectsToGet file. The connector uses this file to determine what type of entity to get and what attributes to retrieve as their metadata. In the Entity Information tab, in the Attributes section panel on the right, select the attribute(s) to be used to create a corresponding field in the field set. Note: Each attribute for a specific entity will also be added in the document's metadata with the corresponding value. Note: The mapping file is generated using the selected entities and the entered Title and Body mappings (if any). Enter the exact same attribute name(s) selected in step ii in the format %[AttributeName]. Note: In the Attributes section, the name in parentheses represents the name of the attribute in the mapping file. In the Title box, when you selected the AccountId attribute, enter %[AccountId]. In the Body box, when you selected the Description attribute, enter %[Description]. CES 7.0.7599+ (April 2015) Click the Relations tab to setup entity relations. Select the attribute(s) to be added to the current entity's metadata and used to create a corresponding field in the field set. Example: When the alias is primarycontact and you select the Account attribute, the field that will be created in the field set is primarycontact.Account. Note: Adding relations can have a significant impact on crawling performances. In the notification prompt that appears, select an output folder, and then click OK.
Three configuration files are generated and prefixed by the unique name of your Organization. Example: CRM2013ObjectsToGet.xml, CRM2013FieldsSet.xml, and CRM2013MappingFile.xml. Configure and index a Microsoft Dynamics CRM source (see Configuring and Indexing a Microsoft Dynamics CRM Source).